Jimmy Ray Walls, 86, of Pecos River Drive, Carlsbad, NM graduated to his heavenly home on January 10, 2018. Visitation will be at Denton-Wood Funeral Home, 2:00 - 4:00 PM, Sunday, January 14, 2018. Services will be held at First Assembly of God, 1502 W Mermod, Carlsbad, NM, 10:00 AM, Monday, January 15, 2018 under the direction of Denton-Wood Funeral Home. Interment will follow in Sunset Gardens Memorial Park, Carlsbad, New Mexico. Jim was born November 19, 1931, in Blackwell, OK, to Johnny Raymond Walls and Phyllis Bessie (Johnson) Walls. He lived in Deer Creek, OK until 1939 when his family moved to Denver City, TX where he graduated from high school. His entire family was saved in a revival when he was 13 or 14 at the Denver City Assembly of God Church. Jim first met Claudine at a church convention in Hobbs, NM in 1949 and he was immediately smitten. After a courtship of letter writing and long distance dating, they eloped on August 11, 1950 and married in Plains, TX at age 16 and 18. Jim moved to Claudine in Carlsbad and started work at IMC Potash Mine in September. He joined the Navy on April 4, 1951 and they moved to San Diego, CA where he started Navy Machinist School. He was deployed to Guam for 20 months and Claudine returned to Carlsbad. Claudine joined him when he returned from Guam to the USS Sperry in the San Diego harbor. They returned back to Carlsbad in April of 1955 where he returned to work at IMC and bought their first home on Sandia Street. Their children Debbie was born in 1956, Jimmy, Jr in 1959, and Darla in 1960. Jim started NMSU-Carlsbad at night in 1959. He was awarded the IMC four-year scholarship which helped him transfer to the main campus in Las Cruces in 1961. Jim and his family lived on campus and he worked at NMSU PSL . He graduated with a Bachelor of Science degree in Mechanical Engineering in 1963 and moved back to Carlsbad where he went back to work at IMC. He accepted a position as general manager of engineering, construction, and maintenance at Ref-Chem in Odessa, TX in 1968. He accepted a position as superintendent of construction, maintenance and engineering for American Magnesium in Snyder, TX in 1970. Jim often traveled internationally discovering and implementing new technologies for his work. 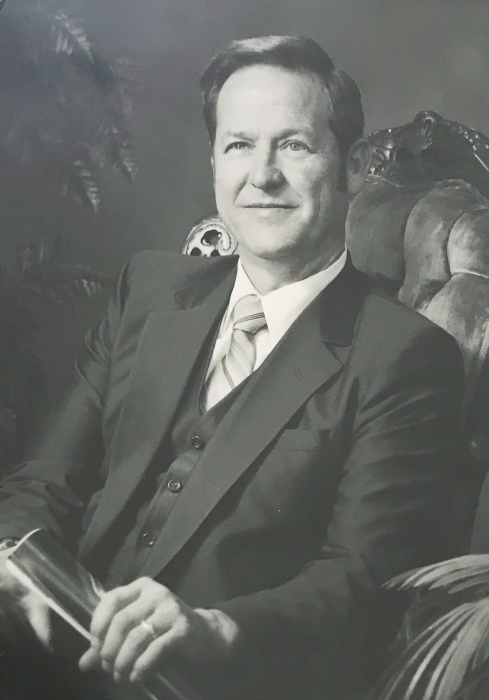 He accepted a position back in Carlsbad with Teledyne in 1972 which later sold to Mississippi Chemical and he became General Manager and later Vice-President of Operations. He accepted a position of Vice President/General Manager for AMAX Chemical Corp from 1983 to 1988. He then began work at the Waste Isolation Pilot Plant with several managerial positions until he retired in 1997. Jim then continued to work as a consultant for Westinghouse for another six years. Jim was deeply touched and honored when he received an honorary doctorate of laws degree at NMSU in 1990. Between the years of 1973 to 1997, Jim served his community on many volunteer positions: Carlsbad Chamber of Commerce Board – 12 years (1983 President), Boy Scouts Camp Wehinapay Board - 14 years, NM Mining Association Board -14 years (1984 President), Bureau of Land Management Multiple Land Use Advisory Board - 13 years, Guadalupe Medical Hospital Advisory Board - 4 years (1 year Chairman), South Eddy County United Way - 8 years (1 year President), College of Southwest Board of Regents - 11 years, NMSU WERC Advisory Board - 16 years & Hall of Fame, Environmental Design Contest Head Judge - 15 years, Evangel University Lay Council - 10+ years, Carlsbad First Assembly of God Board and Teacher - 20+ years, NMSU Carlsbad Advisory Committee - 10+ years, NMSU Deans Advisory Committee - 10+ years & Award of Excellence, NMSU Mechanical Engineering Academy - 10+ years (1 year Chairman) & Charter Member, NMSU College of Human and Community Service - Outstanding Alumnus, NMSU College of Engineering - Outstanding Alumnus. He was preceded in death by his parents, Johnny Raymond and Phyllis Bessie Walls; mother and father-in-law, Claude and Mary Arrington; sister, Bessie Joyce Williams; sister, Rose Loree Russell; sister-in-law, Barbara Walls; and baby daughter in 1957. He is survived by his wife, Claudine Walls of Carlsbad, NM; daughter, Debbie Dugas and husband, Brad of New Braunfels, TX; son, Jimmy Walls, Jr of Sacramento, NM; and daughter, Darla Walls of Dripping Springs, TX; grand children: Aimee VanOmmeren and husband, Jon of Waxahachie, TX; Tiffany Stephens and husband, Jay of Papillion, NE; Whitney Davidson and husband, Brett of New Braunfels, TX; Jeremy Dugas and wife, Emery of Boerne, TX; Chace Walls and wife, Tara of Carlsbad, NM; Chris Walls and wife, Saren of Carlsbad, NM; and honorary Chelsea Nolen of Carlsbad, NM; great grandchildren: Maeryn and Noelle VanOmmeren of Waxahachie, TX; Kaylee, Jack, Tessa, and Allie Stephens of Papillion, NE; Halle, Haven, Hazel, Aidah, Evie, and Ellie Davidson of New Braunfels, TX; Jae Lyn Dugas of Boerne, TX; Nathan, Lucas, and Penelope Walls of Carlsbad, NM; and two more great grandchildren on the way. He is also survived by one sister, Jodie Sconce and husband, Ebb of Aldrich, MO; two brothers, Smythe Walls and Doyle Lee Walls and wife, Sue all of Siloam Springs, AR; sister-in-law, Ann Clark and husband, Sammy of Carlsbad, NM and numerous nieces and nephews and cousins.